My father liked to travel. He took us with him. My father liked to travel. When I was a child, it was his goal to take his family to every state in the nation, and as many Canadian provinces as possible. Some of these states, we lingered in. I had grandparents in Virginia and Florida. My father had been born and raised in Utah; my mother, in Iowa. My older brother was born in Colorado, while I myself was born in Missouri. I grew up in Michigan. We also had relatives in Utah, Texas, New York, Washington, and other places I’m sure I’m forgetting. Before the invention of the car, families tended to live in the same basic geographic area. Movement to other places tended to be a grand decision, rarely taken lightly. These days, though, families get blown on the wind like seeds from a dandelion. His goal was to drive to every state except Hawaii. He never did manage to get my birth family, en masse, to Hawaii. He didn’t even finish the continental United States. By the time my parents divorced, when I was a teenager, I had been to 46 states. Some of those states, we simply drove through without stopping. The original plan for California had been to cut through the northwest corner so my father could say we’d been to the state. The Governor at the time was Ronald Reagan, a man my father despised. He wanted to spend as little time using the California road map as possible. We had a camper. My father had painted a map on the side, showing all the states and provinces we’d been to. 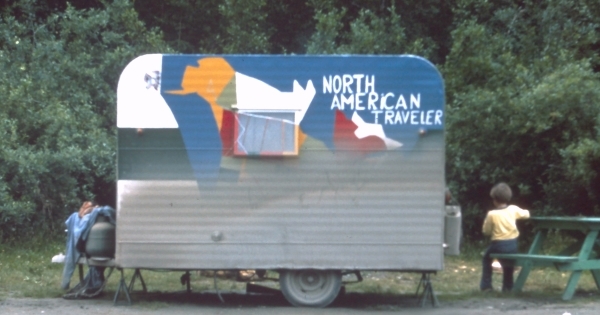 In 1976, the 200th anniversary of our country, he decided we were going to drive from Michigan to one of the newest states in the country, and then back again. In the loop, we would pass through as much of the United States and Canada as we could. We started by going north, following the US-Canada border, and then taking the ALCAN highway into Alaska. Our return trip would dip down through Nevada before heading back eastward. On the Alaska-Canada Highway, by milepost 635, there’s an attraction called the Watson Lake Signpost Forest. It consists of tens of thousands of signs from places around the world. These signs were left by travelers, representing their hometowns, their states, and their countries. Somewhere in that forest, between a green and white city sign for Biwabik (population 1,836, apparently in Minnesota) and a handmade wooden sign from some fellow Michiganders, my father hung his small wood-burned sign saying it was 3600 miles to Marine City, Michigan. I don’t know if it’s still there. I don’t know if anyone has looked at it since. Somewhere along the ALCAN, the axle on my father’s trailer burned out. I smelled it first. I told my father that I thought something was burning. He told me it was a forest fire. There are many forest fires in the forest. I was eight. I didn’t think it smelled like wood burning. I’d smelled wood burning before, and this was a deeply acrid smell that didn’t smell like that. Shortly after, we heard a loud noise, and the trailer stopped behaving properly. We wound up at a podunk gas station, somehow. I don’t remember the details. I just remember thinking that, had my father listened to me, things might have been different. He insisted that it wouldn’t have mattered. By the time the smoke had been evident enough for me to smell it, the axle was too far gone. Years later, I had a Yugo. At about 99,980 miles, it started shaking uncontrollably. I continued to drive it, knowing that I wasn’t going to fix it anymore regardless. All I wanted was to get it to 100,000 miles so I could brag about it. At 99,998 miles, the wheel went flying off. I was on a freeway, and I wound up in the side of a ditch, having been airborne for a few seconds. Someone stopped to helpfully tell me that my wheel was about a quarter mile down the road. My father abandoned the trailer in that gas station, first stripping it of everything of value. The station wagon was laden down for the remainder of the trip, my brother and I folded in like sardines in the back seat. He swore us to secrecy, because he thought that it was illegal to simply leave a trailer there in the middle of nowhere without a proper sale, even though the owners of the station were fine with him leaving it there. Maybe he was right. He took a photo of the trailer. It was covered with mud from the highway. Most of the United States was under the grime. I was seated next to the trailer, my back to the camera. Off to the side. Not really part of the story, just there. A passive invader on the tableau. That was how I often felt around my father. I went through my father’s old slide carousels this weekend, scanning them into digital copies. There are a lot of photos of my older brother, and a handful of me as an infant, often with my brother. There are a lot of photos of my younger brother. There are very few of me after I lost my eye, when I was around a year old. I don’t know if the loss of my eye and the sharp decrease in family photos are correlated. In the five carousels of slides from that Alaska trip, a total of 461 photos, there are only four of my older brother or me. There are none of my parents. Most of the photos are of landscapes; some are of the signs that proved we were passing between man-made borders, because the grass was the same color green everywhere we went. My brother and I thought that the trip would end with my parents divorcing. Instead, my younger brother was born the next year. Our parents stayed together for a little while after that, but not long. By the time I left my father’s house for good, I had been to every state except Vermont, South Dakota, California, and Hawaii. California had been part of the planned itinerary, but the broken axle meant a change in plans. We learned later that there had been a flash flood in the California trailer park we’d intended to stay in. There were deaths, according to my parents. The broken axle became the Grace of God. I’ve been to California since then, but not any of the other three. Vermont will be #50, because I had a chance to go there once during one of our family trips but decided against it. At the time, it was me choosing fun over my father’s obsession. Now, it’s me simply rejecting that obsession. In retrospect now, I wonder how much my father’s vacations were him trying to get away from us while feeling the obligation to take us with him. When I was young and thought about running away from home, I got stuck on the same detail, that I couldn’t run away from myself. We’re becoming a culture of people trying to run away from ourselves. And all we get for it is covered in mud and a broken axle.